I have been inundated with pictures of you with your handbags via email, Twitter and Facebook. I am pleased to announce the winner of my £50 Selfridge Gift card is: Sharn Thornton. My team will be in touch with you via your email address and the gift card will be on your way to you! As this competition has been so popular, I am looking to do some more in the future. Keep you posted! I’ve arrived – my first official post! I have finally joined the world of blogging and there probably isn’t any going back after this – mainly because I have shouted from the rooftops about the blog. WWMS has been a long thought out process, but one I have dedicate a lot of my time for. I just want reiterate that this is a personal blog, so although I will touching on fashion and beauty, it won’t be primarily a fashion or a beauty blog. This blog hasn’t been launched to focus on my work or my clients – although I may touch on work from time to time. One of the main reasons I have started blogging is because most people see my business side, not my personal side and I do have one. So this is a look at things away from my work. The other reason is because I want to log a period in time – it just happens to be somewhat publically! I will mainly cover what happens in my life, what I think, what I buy – you get the general feel. You can see it as an extension to my Twitter account, as sometimes 140 characters just aren’t enough! 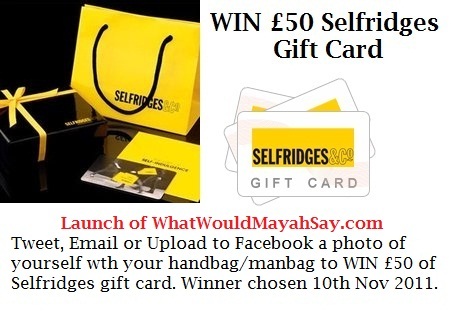 To launch the blog, I have a small giveaway – a £50 gift card for Selfridges & Co.
All you have to do to be in with a chance of winning it, is either tweet, email or upload onto Facebook a photo of yourself with your favourite handbag/manbag. All contact details are on the contact page. Winner will be chosen on 10th November, so get snapping!